Every now and then when someone hears me say I’m a homesteader, they’ll ask what that means. Did the government give us free land? Do we have indoor plumbing? Do we buy anything from a store? The short answers to those questions are no, yes, and yes. Although homesteaders were originally people who took advantage of the Homestead Act in 1862, which is when the government was giving out free land to people who were willing to move west, the word has a slightly different meaning today. However, the original homesteaders were far from freeloaders or people living on government aid. In order to keep their land, the original homesteaders had to actually turn that land into a productive farm, which was no easy task. They were busting sod, moving rocks, cutting down trees, and building their own houses and barns. Many of them were city slickers who had no experience doing any of those things. Still, they left the comfort of their lives back east, looking for a better life. 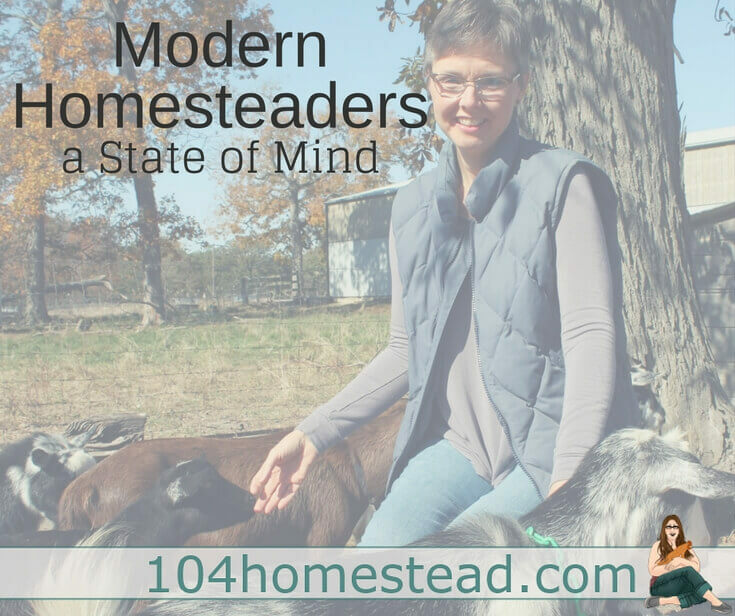 The desire for a better life is what ties them to us modern homesteaders. Like most modern homesteaders, we had no clue what we were doing when we left our suburban home and bought 32 acres on a creek in the middle of nowhere. Our livestock experience had consisted of two cats and a poodle. And we were very proud that our backyard garden had finally yielded edible food. In fact, the year before we moved, we had grown enough tomatoes on eight plants that were able to freeze enough to last a whole year. A lot of modern homesteaders, however, realize that they don’t have to move to the middle of nowhere to take charge of their destiny. They can start growing their own food right where they are. They can buy solar panels to create their own energy. They can shop at the farmer’s market and get to know their farmers and become a smarter consumer. Homesteading is a lifestyle of self-sufficiency. It is characterized by subsistence agriculture, home preservation of foodstuffs, and it may or may not also involve the small-scale production of textiles, clothing, and craft work for the household use. Homesteading is not defined by where someone lives, such as the city or the country, but by the lifestyle choices they make. When I wrote the first edition of Homegrown and Handmade, I was excited when I met people living in cities who were doing more per square foot than we had ever dreamed. Like many people, I thought we would need at least ten acres in the country to grow our own food. But I met people in Chicago who had chickens and ducks for eggs, goats for milk, bees for honey, a garden for vegetables, and trees and brambles for fruit. They canned, fermented, dried, or froze their produce to preserve the harvest, and some even made their own beer and wine! It made me feel like a serious underachiever with my underutilized 32 acres. This showed me that homesteading didn’t have to happen on a stereotypical homestead. Today we don’t have to give up everything and travel a couple thousand miles to find a better life. We can create a better life where we are. We can start a garden and get a few backyard hens. If we don’t have a yard, we can garden at a friend’s house, in a community garden, on a rooftop, or on a south-facing balcony or window. If backyard hens are illegal in our town, we can work to get the law changed. If we decide that we want more than our current location can support, we can start looking for a new place nearby so that we can maintain the security of our current job while embarking on a better life. Like the homesteaders of old, we quit saying, “someday, I’m gonna …” and we take that first step. The second edition of Homegrown and Handmade was just released this month. You can purchase your autographed copy directly from Deborah, and you’ll also receive a 25-page recipe supplement, a coupon for an online soapmaking class valued at $27, and free shipping within the US. Or click here to order through Amazon. Deborah Niemann, of Thrifty Homesteader, and her family moved to the country in 2002 to start growing their own food organically. 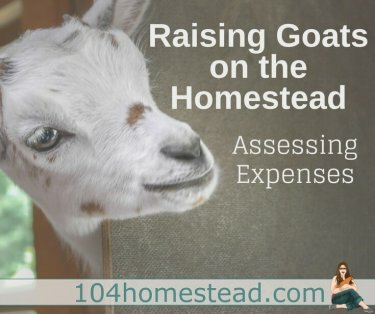 She is the author of Homegrown and Handmade: A Practical Guide to More Self-Reliant Living and Raising Goats Naturally.